XSE Analytical Balances offer exceptional weighing performance and quality assurance features as well as excellent ergonomics. They are the perfect workhorse solution for a multitude of workplaces. With a wide range of accessories available and multiple connectivity options, XSE balances open up a world of opportunities for different weighing applications. XSE Analytical Balances offer exceptional weighing performance and quality assurance features as well as excellent ergonomics. They are the perfect workhorse solution for a multitude of workplaces. The innovative StatusLight™ takes the worry out of weighing. The clearly visible green light lets you know when it’s safe to start — all tests are up-to-date and the balance is level and functioning correctly. With a wide range of accessories available and multiple connectivity options, XSE balances open up a world of opportunities for different weighing applications. Designed, engineered and manufactured in Switzerland for outstanding quality you can trust. The StatusLight built into the terminal uses color to indicate intuitively the status of the balance: Green means ready, yellow is a warning and errors are shown with red. The StatusLight clearly communicates if the balance is ready for you to start your weighing task. StatusLight The StatusLight clearly communicates if the balance is ready for you to start your weighing task. Green is ready, yellow is linked to routine testing with TestManager and red means immediate corrective action, such as the balance is out-of-level. Using the balance touchscreen, your testing SOPs can be implemented in the TestManager embedded software. Whenever a test is due, a message will be displayed on the screen and you can simply follow the test instructions provided. MinWeigh protection MinWeigh protection always ensures you are weigh accurately for the upmost process security. Reliable Results Excellence Analytical Balances combine patented METTLER TOLEDO weighing technologies with decades of weighing expertise to ensure you get the best weighing results — quickly and reliably! While enjoying comfortable weighing, patented measurement technologies are working behind the scenes to give you highest resolution, fastest and most stable results. 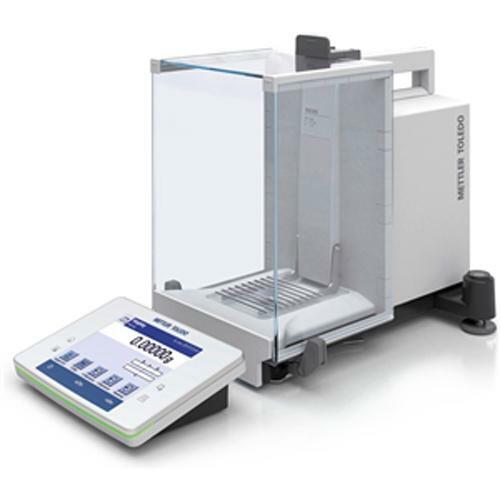 Good Weighing Practice™ The XSE and XPE analytical balances have been developed in accordance with GWP®. METTLER TOLEDO developed GWP®, Good Weighing Practice™, as a standardized scientific methodology for secure selection, calibration and operation of weighing equipment. GWP® provides the documented evidence for reproducible weighing results in harmony with all current quality standards in laboratory and manufacturing. Users who focus on stable processes, constant product quality, lean manufacturing or regulatory compliance, can use GWP® as the benchmark to select and calibrate their weighing equipment. Automatic Data Handling METTLER TOLEDO’s LabX® software provides flexible SOP user guidance on the balance touchscreen. With automatic data handling, calculations and reports, Quantos systems powered by LabX easily fulfill the highest process security and traceability requirements and support your moves towards a paperless lab. Easy Cleaning With the unique SmartGrid, and the draft shield that can be disassembled in seconds, always be sure that your weighing area is clean and safe. SmartGrid The SmartGrid allows any spilled samples to fall through the weighing pan without affecting your weighing result, and the drip tray underneath easily captures any spilled solids and liquids for safe disposal. Draft shield Minimum risk of contamination, maximum protection for your sample: The draft shields and the drip tray can be fully dismantled in seconds without the need for tools. RFID Based Operation — Pipette Modern pipettes have an embedded RFID chip that stores relevant information such as pipette ID, pipette volume, last calibration date and next calibration date. With the new integrated RFID reader checking this information is just a matter of seconds. With just one scan, the integrated RFID reader collects and shows on the terminal all the information stored in your pipette RFID chip — secure and fast. The innovative EasyScan™ option checks testing and calibration dates on RFID tagged pipettes. The built-in balance application reads information from RFID tagged pipettes and guides you through the pipette testing process (if required). A separate process is available if you need to ensure repeatability, e.g. for reagent critical assays, or for user training and familiarization. For the most accurate results, repurpose your balance in seconds and use a dedicated evaporation trap from METTLER TOLEDO. Smart Tag adhesive RFID labels are available to make your individual pipettes ready for RFID processing. RFID Based Operation — Titration Enter titration sample information securely at the balance and effortlessly transfer all information to the titrator via the titration beaker & SmartSample RFID tag. Using the new SmartSample™ accessory enables a dedicated titration workflow to provide a new inter-device communication between METTLER TOLEDO laboratory equipment. Together with the new InMotion™ Autosampler from METTLER TOLEDO it is now possible to completely remove transcription and ordering errors as well as improve efficiency simply by using the new SmartSample balance accessory in combination with the embedded XPE or XSE balance workflow. Identify and weigh your titration samples at an XPE or XSE Analytical Balance simply by entering the sample information at the balance and let the technology remove all transcription and sample ordering errors!